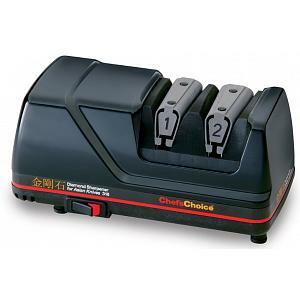 This electric knife sharpener from Chef's Choice allows you to easily apply the sharp Trizor XV edge for ultimate sharpness and effortless cutting. The sharpener combines the strength and durability of the Trizor edge with the flawless and super sharp 15º XV technology. 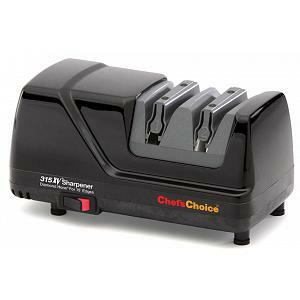 The knife sharpener is perfect for converting traditional 20º edges of household knives into high performance Trizor 15º edges. The sharpener comes in a platinum colored finish and its advance and patented flexible spring will guide your knives for accurate and control of the sharpening angle. The 3 stage sharpener provides optimal versatility and features a 100% diamond and advanced stropping stage. 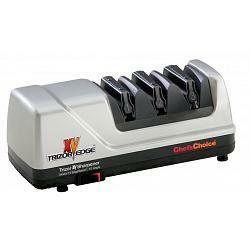 The electric knife sharpener can be used for both straight edge and serrated blades. 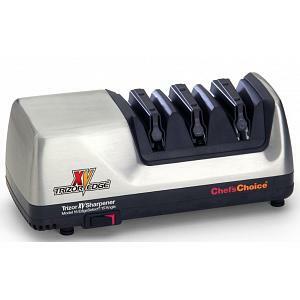 The Trizor knife sharpener from Chef's Choice comes in a nice gift box and is the ideal sharpener for chef, santoku, bread, hunting, fillet, boning, and pocked knives.